Jack and Annie are ready for their next fantasy adventure in the bestselling middle-grade series-the Magic Tree House! It's a time for giving thanks . 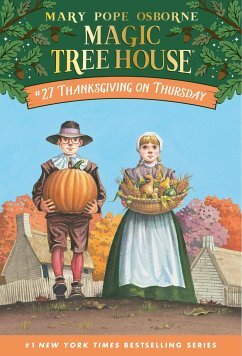 . . when the Magic Tree House whisks Jack and Annie back to 1621 on the first Thanksgiving Day. The Pilgrims ask them to help get things ready. But whether it's cooking or clamming, Jack and Annie don't know how to do anything the Pilgrim way. Will they ruin the holiday forever? Or will the feast go on? MARY POPE OSBORNE is the author of the New York Times number one bestselling Magic Tree House series. She and her husband, writer Will Osborne (author of Magic Tree House: The Musical), live in northwestern Connecticut with their three dogs. Ms. Osborne is also the coauthor of the companion Magic Tree House Fact Trackers series with Will, and with her sister, Natalie Pope Boyce.